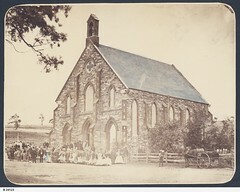 By 1893 the press reported that there are five churches and three public-houses in Willunga. On Sundays the population turn out in their best attire—plug hats, black coats and pants, new bonnets, bright skirts, and all the rest of it. (Quiz and the Lantern Fri 4 Aug 1893 p13). There are four churches presently active in Willunga – St Stephen’s Anglican Church, Willunga Uniting Church, St Joseph’s Catholic Church and Coast and Vines Pentecostal Church. 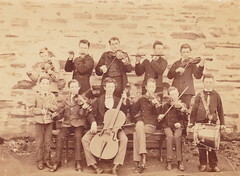 Children's concert, Willunga Church of England, 1911. 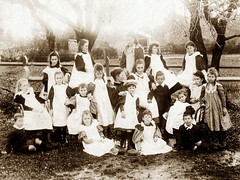 Pupils from the Church of England Day School, Willunga, ca 1896. Do you remember Church life in Willunga ? Then Join up and add your memory here.